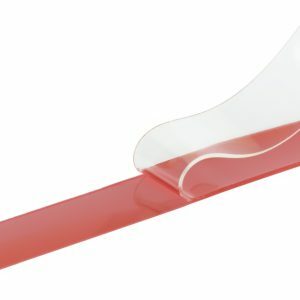 Reverse Wound Transfer Tape (56750) is a 5 mil (0.13mm) fiberglass stabilized modified acrylic adhesive transfer tape with brown siliconized paper liner reverse wound on a 1″ plastic core. The Heavy Duty ATG Tape is specifically designed to be used in ATG (Adhesive Transfer Gun) dispensers. The ATG system automatically rewinds the tape’s liner inside of the dispenser as the tape is applied (tape is dispensed without liner). Glass stabilization allows for cleaner unwinding. Excellent adhesion to paper, most plastic films, metal foils, etc. Ultra-violet light has little or no effect on adhesive. Extra mass of adhesive ensures bonding to rough & textured surfaces. Applications Used for mounting nameplates, picture framing, product assembly, design and packaging of prototypes, sealing envelopes, paper web splicing, and general mounting and holding.